In December YouGov gathered open-ended nominations from panellists across 35 countries, asking them simply: “Thinking about people alive in the world today, which [man or woman] do you most admire?” These nominations were then used to compile a list of the 20 men and 20 women who received the most nominations and were nominated in at least four countries. An additional 10 popular local figures were added to the lists for individual countries. Over the beginning of the year we then used the lists to poll each of the 35 countries asking two questions: “who do you truly admire?”, where respondents could make multiple selections, and “who do you MOST admire?”, where they could only pick one. These two numbers were combined into a percentage share of admiration, displayed to the right of each name in the first graphic and table below, which shows the full results for every country including local celebrities and public figures. The results for those countries is shown in the charts above. 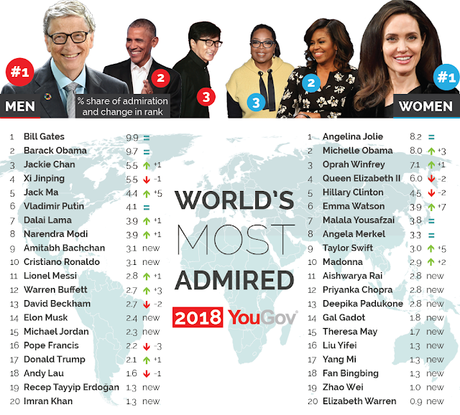 Bill gates was the most admired man because he finished in the top four in every country, while Barack Obama finished low in China and Russia. Obama actually was most admired in 19 countries, while Gates finished first in 6 countries. Note that Donald Trump did not do well in the survey. While Obama finished second with 9.7%, Trump was far behind in 17th place with 2.1%. Perhaps even more embarrassing for Trump is the fact that he finished behind Obama in 34 of the 35 countries -- and in most he was far behind (seee second chart). 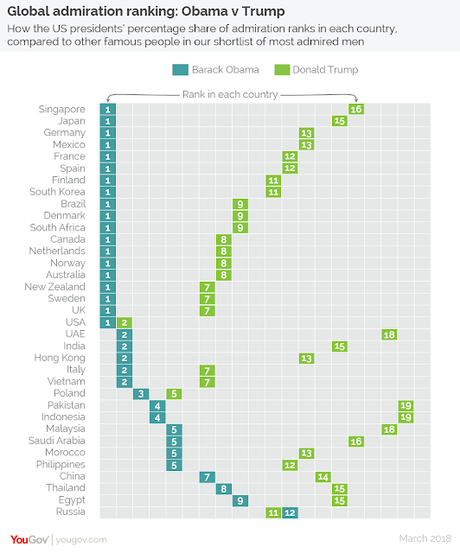 The only country that rated Trump higher than Obama was Russia, and that was only one place better (Trump finished in 11th and Obama in 12th there). 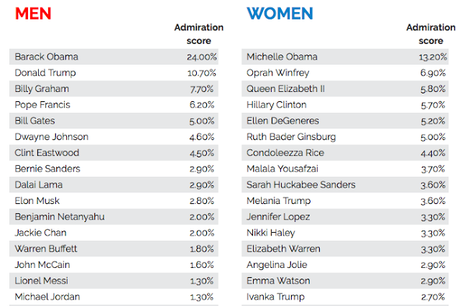 Among women, Michelle Obama finished in second place with 8.0%. Angelina Jolie was first with 8.2%. Melania Trump did not finish in the top 20. The chart below shows the rankings in the United States. Trump's supporters were able to get him up to second place (10.7%) -- but he was still 13.3 points behind Obama (24%). Michelle Obama finished first among women with 13.2%). Oprah Winfrey was second with 6.9%. Melania Trump finished in 10th with 3.6%. Trump has done his best to destroy the legacy of the Obama's, but they remain far more popular than he is -- both in the United States and in the world.